Black Box Trading - What Does It Mean? What is "black box trading"? 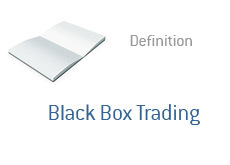 What is the definition of "black box trading"? "Black box trading" is basically a proprietary trading system that utilizes pre-programmed logic to generate buy and sell systems. "Black box trading" involves the use of a computer that will cycle through a program to identify potential buys and sells. The benefits of a "black box trading" system is that a computer isn't subject to human error. In addition, a computer can do millions of calculations per minute that a human being is just not capable of. In addition to generating potential buys and sells, the "black box trading" system will also enter and close orders based on pre-programmed logic. The benefit to this type of system is that a computer doesn't tire, and is capable of processing tens of thousands per trades per day. A human being is not capable of this type of volume - in addition, a human being will make errors along the way in the filling of their trades. A person or company may use a black box trading system to generate profits, or they just may use such a system to assist in the processing of orders. Some hedge funds and pension funds utilize a black box system in order to help them manage their trades. A "black box trading" system is basically just a computerized trading system that utilizes pre-programmed logic to generate buys and sells.